The lush month of June brings to fruition the planning and plantings of previous months. Spring blooms are over, and the summer ones begin. When I look back on the flowers that bloomed this month, I am astounded. The lilies were spectacular this year. The Easter lilies bloomed almost the entire month, and when they were finished, the stargazers showed up. 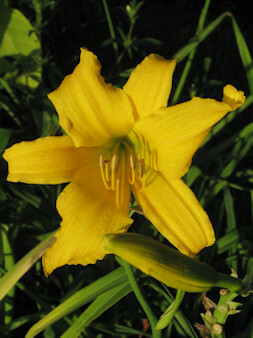 The daylilies bloomed prolifically this year, especially Plum Tree and the pass along yellows from my mom. Even though the summer still has a long way to go, I don’t know if it can surpass the month of June. While visiting a neighbor the other evening, I was taken by their lovely bleeding heart vine and just had to share it. They have had the vine at least four years, protecting it every winter. It is a wonderful specimen with its myriad of flowers and lush growth. 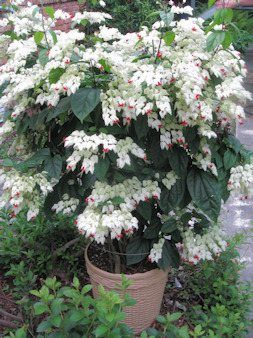 This vine, which is clerodendrum thomsoniae, is a tropical plant that has very long-lasting flowers. It will take some partial shade and still bloom. Since these plants bloom on new wood, it is best to prune them after they bloom. They need moist, but well-drained soil, and regular fertilizing will keep them in bloom. These neighbors take care of their plants but are not really gardeners, but they sure have been successful with this vine. I have the red bleeding heart vine (clerodendrum speciosum), and now, after seeing my neighbors’ white bleeding heart, I am tempted to get one of these too. Strange things seem to be happening around here lately. First, there were all the creatures showing up, many of which we had not seen in years. Turtles, cuddling centipedes, and hummingbird nectar swilling opossoms. 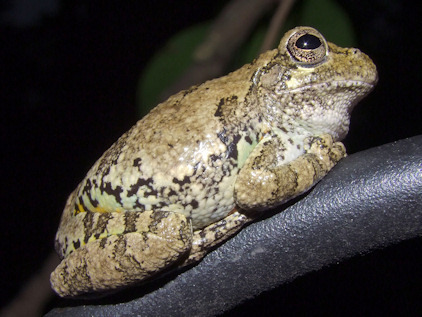 Now a gray tree frog has shown up – never have seen this one before. Two snakes have also roamed around the yard in the last three days, a black racer and a corn snake. (No photos of those guys. Hubby was the only one who got close enough to identify). I don’t know why, all of a sudden, all these creatures are coming around. Are we making our property a little too hospitable? And then, there are the plants. 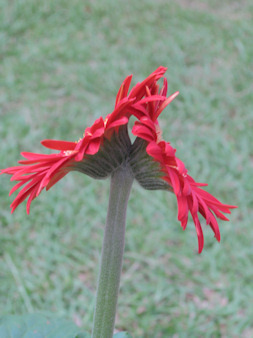 While visiting a neighbor, they showed me a gerber daisy that was very different – a Siamese twin gerber daisy. The stems were fused together with just the flower heads free. 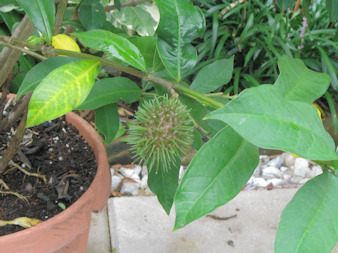 Then, they showed me what I take to be a seed pod on one of their plants. Neither I nor they have ever seen anything like this. This plant has yellow trumpet shaped flowers, and the name escapes me right now. My neighbors said they have had the plant for several years and nothing like this has shown up before. So, what’s going on with all these unusual sightings all at once? When it comes to the animals, I like to think I’ve just made a great diversified ecosystem for them to enjoy. As for the plants in my neighbor’s garden? Maybe it is the heat. 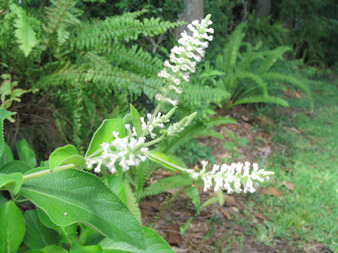 I noticed today that the sweet almond shrub (aloysia virgata) I planted in March is blooming again. I was surprised to see the flowers because I thought it only bloomed in the early spring. After doing some research on the Internet, I found out that it blooms off and on until frost. The flowers are just starting and are still small, but the fragrance is unmistakable. I wish you could experience the sweet, delicate perfume of this shrub. This is another one of those great plants that no one seems to know about because the nurseries don’t carry it. I have only seen it one time, and then,there was only one plant, and I bought it. Mine has already grown a great deal since being planted, and I can’t wait for it to get bigger so there will be more flowers and sweet scent from this shrub. This is the time of year that Southern gardeners are tempted to stay in the air-conditioned house and only look out the windows at the garden. Sometimes it is just too hot to try and work outdoors. So like our northern friends who spend the winter looking at garden catalogs and books, we usually do that in the torrid summer. I have been rereading several of my garden books trying to get ideas for next year. There are three in particular that I have been concentrating on – Sunbelt Gardening, Heat-Zone Gardening, and Tough-As-Nails Flowers for the South. Sunbelt Gardening by Tom Pease is subtitled Success in Hot-Weather Climates. This book contains chapters on both southeastern and southwestern gardening as well as winter gardening. The author, using his experience as a Texas gardener, lists plants that will do well in zones 7 – 10. In hot climates, it is often not the cold hardiness of plants that concerns us but a plant’s ability to take our hot, humid, and often dry weather. If you love plants, you will appreciate this book’s extensive list of perennials, shrubs, vines, grasses, bulbs, and annuals that can take the heat. Another book that I have been looking through is Heat-Zone Gardening by Dr. H. Marc Cathey. What is nice about this book is that it lists a plants heat zone and hardiness zone. Only listing a plant’s hardiness zone can cause disappointment for many Southern gardeners. For example, I live in zone 8, the same as parts of Oregon, but there is no way that I can grow all of the plants that those gardeners do. Many of the plants that grow in the Northwest simply will not take the heat of our summers. When you consider that many of the big box stores sell plants strictly by hardiness zone, you understand why they have peonies and lily of the valley for sale here in the spring. This book is really good for new gardeners who are unfamiliar with plants that just won’t make it down here. The last book, Tough-As-Nails Flowers for the South by Norman Winter, is for gardeners in zones 6-10. This book, too, is a great reference for plants that thrive in our area. The listed plants will give four seasons of flowers for your garden. For each plant listed there is a color photo, growing requirements, landscape use, and, especially helpful, a toughness description. So, in the heat of a summer afternoon, I sit inside an air-conditioned house, sipping ice tea, and planning how next summer my garden will have even more colorful flowers for me to look at through the windows. Well, this afternoon, we finally received a good rain shower – .88 inches. This morning I had finished the watering I had started yesterday. Now with this rain, it should be several days before I have to start watering the garden again, that is, if we don’t have the rain that is predicted for the weekend. It seems that we either have no rain or too much. Gardening under pine trees is the real reason I have to water the flower beds so much. The pines just soak up the water. It is not a problem for the shrubs, usually, but the smaller perennials and annuals need to be watered frequently. That is when the mulch and the soaker hoses I have in the beds really helps out. This morning I was able to work in the garden. I planted the monarda and two more coleuses I bought Saturday. In addition, I potted up the Confederate Rose trees and Crybaby trees I had started earlier and gave them to a neighbor who had admired mine. She told me that she had been trying to find them but never could. I explained that they are really pass along plants and that they are rarely sold at nurseries. It is a shame that the garden centers don’t carry more plants like those. You can see from this photo that summer lushness has arrived. Here are the toad lilies I transplanted in the spring in front of elephant ears. With this latest rain, I’m sure they will get even bigger. The weather here has been hot and dry. This morning I went out to plant some of my new purchases about 6:45 AM to try and beat the heat. We received about a quarter inch of rain Saturday, so I didn’t water anything on Sunday. Since I had been watering regularly, I thought that rain would reinforce my supplemental watering, so that I wouldn’t have to water for a few days. Today, when I went to plant the pentas in the front side garden, the ground was bone dry. I couldn’t believe how dry everything was in that area. Needless to say, after putting in the new plants, I really watered that area. Tomorrow it will be back to the soaker hoses so that the ground can be moist for more than just the top inch. Everything still looks okay, but by tomorrow I’m sure there would be wilting if the plants don’t get watered. Ah, the joys of summer in the deep South. Plants in the garden are still looking good. The Stella d’Ora, Plum Tree and the old-fashioned yellow daylilies are still blooming. Of course, the annuals are doing well, but I did not plant as many this year as I have in the past. 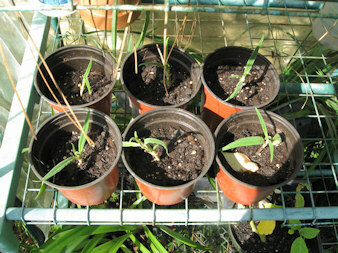 The gladiolus plants are just starting to put on their show. These bicolor ones are doing the best. They are really able to take the heat. 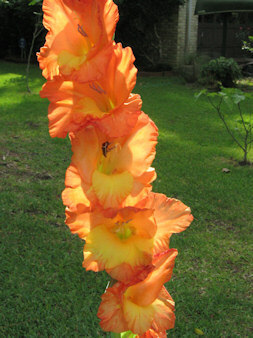 These glads are the ones I have had the longest, so the bulbs are very big. They were labeled as yellow; Goldfield, I think when I purchased them. However they were mislabeled and were instead peach with yellow centers. At first, I did not like them at all, but they have grown on me. Now, they are my favorite. I usually cut one and bring it in the house in a bud vase. Hubby really loves this flower. Here it is with the sun back lighting it. If you look closely you can see a little bug trying to find some shade. These glads have made babies, and I am thinking that I might plant them next to my peach and yellow hibiscuses or next to some of the orange flowered canna in the back garden. Now, if I can only find the time to carry out these ideas I keep coming up with. Yesterday, I wrote about how I broke my resolution not to buy any more plants until cooler weather set in. I posted about the clerodendrum I bought, but that was not the only purchase. 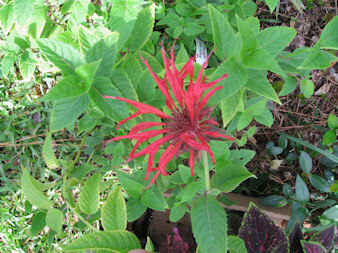 I also had to have a red monarda. The tag stated it was Monarda didyma ‘Jacob Cline’. It is a beautiful shade of red and will fit in with the other red flowering plants in the entry garden. It looks like there is more than one plant in the container, so when I plant it, I will try to separate the plants since it looks very overgrown. I also purchased some coleus and pentas to fill in a few places that seem to need some color now that so many of the spring flowering plants have finished blooming. I did receive a free plant from a friend. I will need to pot it up soon. She had just divided hers up and said that some of the leaves were damaged from too much sun. I plan on placing this on the front porch so it will only get some morning sun and bright light the rest of the day. Since it is tender, having it there will help me not forget it when the cold weather comes. It was too hot and sunny by the time I could start gardening today, so I decided I would wait until it gets cooler in the early evening to start planting some of my purchases from yesterday. I think this will also be better for the plants than having them being planted in the middle of a hot summer day. I know I’ll be watering the newly planted ones everyday next week if we don’t get any rain. Well, at least that will keep me busy and out of garden centers. Well, it has happened again. I said I wasn’t going to buy any more plants. I told my daughter that I just didn’t feel like planting one more thing. From now on, all I was going to do is water plants and weed. But, then today, at the first nursery where I stopped, I found a plant I just had to have. 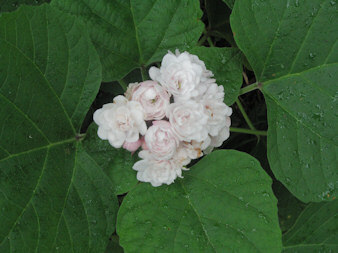 It is another clerodendrum. I don’t know what it is, but I am starting to have an awful lot of plants from this family. Well, today I bought Clerodendrum frangrans pleniflorum. It doesn’t seem to have a common name, though the Southern Living Garden Book says it is sometimes referred to as Cashmere Bouquet (that name usually is applied to C. bungei). 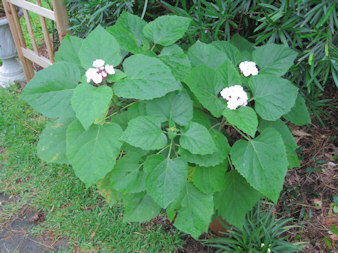 The flowers do smell like C. bungei and the leaves are very similar in shape, size and color, too. 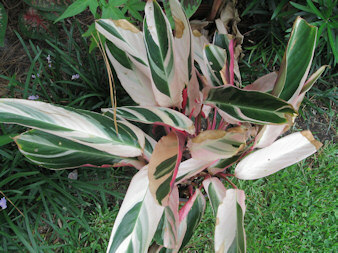 But, whereas C. bungei’s leaves when crushed are malodorous, this new one’s leaves are not. This shrub was about three feet high and almost as wide. It looks like there are two plants in the three gallon pot. 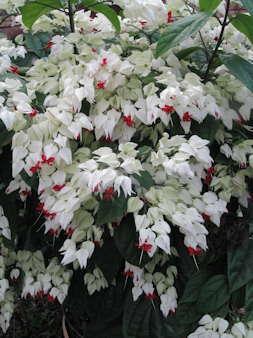 This is supposed to spread as most of the clerodendrums do, but I have not had a problem with that. Any of the C. Bungei or C. splendes that show up in an unwanted area, I just remove and give away or throw away. The flowers look like small white roses and are in clusters. One of the problems of impulse purchases is finding a place to put the new unplanned for plant. I have a place in mind because I have been taking out some plants that just don’t fit in my garden anymore. They were things I started off with just to fill in areas or to fill in until the perennials grew big enough. 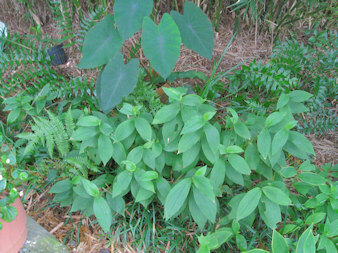 Plants like four o’clocks and ruellea, are coming out. Some plants are being moved to less sunny locations since we have lost trees, and there is so much less shade for them now. Of, course, all this makes space available for new things. So, even though it will be very hot tomorrow, it looks like I will be planting this new purchase in the garden.